This article summarizes the study “Kohlbacher M., Gruenwald S. und Kreuzer E.: Corporate Culture in Line with Business Process Orientation and its Impact on Organizational Performance”. The paper was presented at the 6th International Workshop on Business Process Design at the Business Process Management Conference 2010, which took place at Stevens Institute of Technology (New Jersey, USA) in September 2010. The study focuses on the question whether there is a positive relationship between a culture in line with the process approach and financial performance, delivery speed and delivery reliability. The study uses a sample of 132 Austrian manufacturing firms. The results of the study show that firms which actually live the process approach outperform other firms in terms of profitability, order-to-delivery speed, and delivery reliability. The organization’s employees can describe the design of the process they work for. The employees know how their work affects subsequent work, customers and process performance. Teamwork between different departments of the organization can be taken for granted. The organization’s employees understand that the purpose of their work is to fulfill the needs of the internal/external customers. The study has been recently published by Springer (www.springerlink.com). Process orientation is also a matter of enterprise culture. The real problems when implementing the process orientation approach are of a cultural nature (Hinterhuber, 1995). The cultural fit is an important issue since people and processes must combine to produce output (Armistead and Machin, 1997). Only a culture based on teamwork, willingness to change, customer orientation, personal accountability, and a cooperative leadership style goes hand in hand with the process approach (Hammer, 2007). 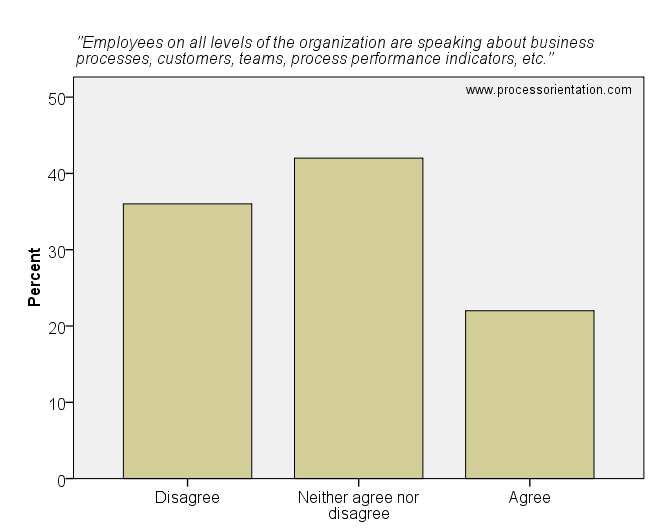 This article discusses the results related to corporate culture of the process management survey. Survey details (research design, sample, etc.) can be found here. Teamwork (also between different departments) can be taken for granted in the organization. Our organization's employees understand that the purpose of their work is to fulfill the needs of the internal/external customers. Our firm's employees feel accountable for enterprise results. Therefore, in most of the surveyed firms, the employees’ willingness to change is on a moderate level. Changes in the way work is performed are accepted by the employees in a sluggish manner. Employees on all levels of the organization are speaking about business processes, customers, teams, process performance indicators, etc. 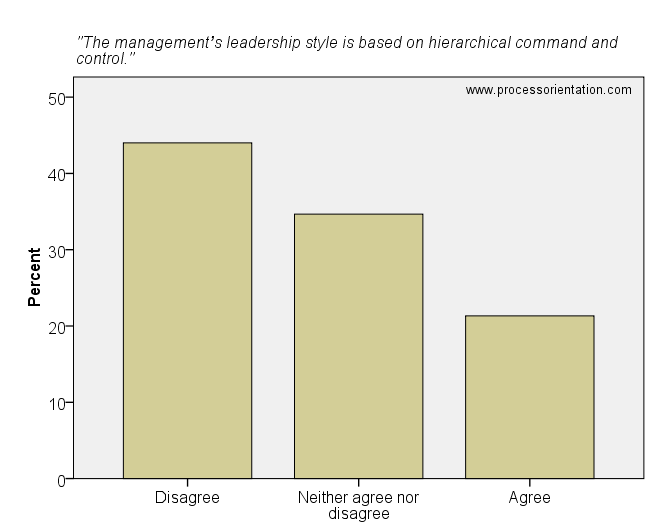 The management's leadership style is based on hierarchical command and control. Process orientation is also a matter of enterprise culture. The real problems when implementing the process orientation approach are of a cultural nature (Hinterhuber, 1995). The cultural fit is an important issue since people and processes must combine to produce output (Armistead and Machin, 1997). Only a culture based on teamwork, willingness to change, customer orientation, personal accountability, and a cooperative leadership style goes hand in hand with the process approach (Hammer, 2007). Existence of inter-departmental teamwork. Process-oriented organization needs a culture which values teamwork, since business processes which cut across functions must be operated by people in a team (Hammer, 2007). Teams play an important role in process management, since e.g. a large process such as order fulfillment still requires working together across functional and/or geographical boundaries (Armistead and Rowland, 1996). Also, Hinterhuber (1995) states that a precondition for successful process management is employing empowered teams. Customer-focused attitude of employees. Companies have to increasingly act and think in a customer-oriented way. It is often argued that organizations that emphasize functions and hierarchy fail to focus on the customer (Hinterhuber, 1995; Schmelzer and Sesselmann, 2006; Gulati, 2007). In contrast, in a process-oriented organization, each business process has a clearly defined customer who receives the result of the process (Schantin, 2004). 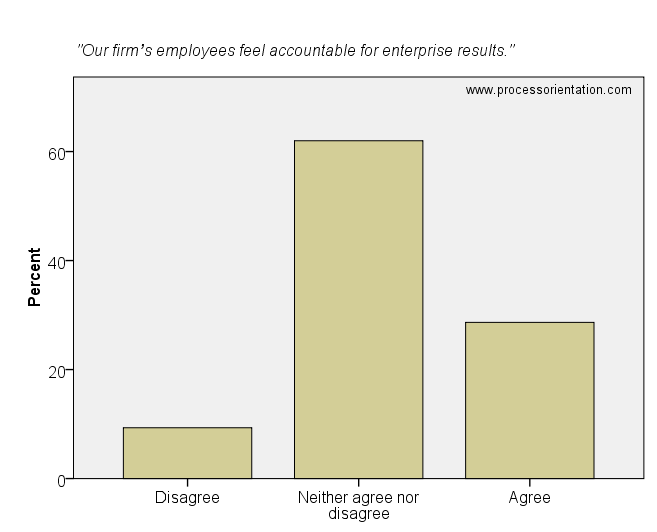 Employees’ accountability for enterprise results. Only organizations whose culture values personal accountability will find it possible to move forward with their degree of process orientation (Hammer, 2007). “Commitment to business success” is a cultural artifact exhibited by a process-centered organization (Hammer, 1996). Employees’ attitude towards change. The lack of a change supportive culture is often named when process improvement actions fail (Tenner and DeToro, 2000). As business conditions change, process designs need to evolve, and it is the task of process owners to guide that evolution (Hammer and Stanton, 1999). A remarkable part of a company’s change-capability is based on its employees (Nyhuis et al., 2008). Use of process language. Process orientation is a construct which becomes “real” through communication and interaction, i.e. the construct becomes real if it is communicated by means of language. By communicating about business processes and their design, process orientation becomes a reality (Gaitanides, 2007).